Madame C. J. Walker (December 23, 1867–May 25, 1919), was an African American philanthropist and tycoon. Born Sarah Breedlove in Delta, Louisiana, the first member of her family born free, she was raised on farms there and in Mississippi and started out by picking cotton on a plantation. She was orphaned at age seven, married at age fourteen (to Moses McWilliams), and widowed at twenty, at which point she moved to St. Louis, joining her brothers. She worked as a laundress for as little as a dollar and a half a day, but she was able to save enough to educate her daughter. She became interested in hair tonics while trying to treat a scalp ailment that left her temporarily bald. In 1905, Sarah moved to Denver, working as a hair tonic sales agent for Annie Malone, another black woman entrepreneur. 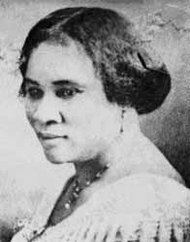 She married her third husband, Charles Joseph Walker, a St. Louis newspaperman, changed her name to "Madam" C. J. Walker, and founded the Madame C.J. Walker Manufacturing Company to sell hair care products and cosmetics. By 1917, it was the largest business in the United States owned by an African-American. The Guinness Book of Records cites Walker as the first female American self-made millionaire. Yet Walker saw her personal wealth as not an end in itself but a means to help promote and expand economic opportunities for others, especially African Americans. She took great pride in the profitable employment—and alternative to domestic labor—that her company afforded many thousands of black women who worked for commissioned agents. Walker was also known for her philanthropy, supporting African American's educational and social institutions from the national to the grass roots levels. Including donating to such causes as the NAACP, the Tuskegee Institute, and Bethune-Cookman College. Walker's daughter A'Lelia Walker, carried on this tradition, opening her mother's and her homes to writers and artists of the emergent Harlem Renaissance and becoming a catalytic figure in that movement.